Heavy and sweet. Some say that Citrine can bring a hint of sunshine to dull days, thus the nickname sunshine. Citrine was the type of gem that had a hard time due to her small stature, usually, the last one picked for every team that required any sort of athletic prowess. This has been her lot in life; though it had been challenging, and not exactly a glamorous one, she has learned to accept it with grace. Despite her failings in instances of popularity or "fitting in", Citrine excels in many others. She's extremely intelligent and usually has things figured out long before everyone else. Her logic, common sense, and fair judgment make her wise beyond her years and can be quite the scholar. Even though she possesses brainpower far beyond the average populace, she does not often get asked for advice. Citrine is an extremely passionate and dedicated gem when it comes to her interests and goals, and though she doesn't always realize it, this oftentimes alienates others. Though she is generally kind and understanding, Citrine can get a little pushy and overbearing when she thinks her beliefs are being questioned. She has a hard time discerning when people are joking or when it is serious business (though usually, it is the former and Citrine herself is the brunt of the joke). Her sense of humor could use a little work. Still, she enjoys spending time with friends and possesses a true and loyal heart. One thing she hates is letting people down so she tries extra hard to finish what she begins and never gives up when people are depending on her. Citrine has an affinity and passion for alien technology and antiquities. Because of this, she spends most of her time indoors studying her artifacts. However, if there is an opportunity to leave the safety of the lab for a chance to acquire new alien technology she will jump at the opportunity. Citrine possesses bravery and hardiness of a unique kind. At first glance, people do not see it in her, but when it is needed, it shows itself in spades. Because she has very little experience of the world beyond her own backyard so to speak, she can often come off as naïve. This combined with her stubbornness and tenacity can make her a difficult and frustrating person to deal with, but if you find some way to show her appreciation for her hard work and ambition she will be your best friend for life. Citrine was created to work for the advancements of military technology for Red Wine Diamond. However, working on experiments and reserving your own lab space has to be earned. Citrine is still a trainee, and for now, has been assigned a position for being <insert higher ranked gem name here> assistant. Sadly this has made her nothing more than a secretary and delivery gem, but she dreams of being able to impress her peers one day and acquiring her own lab space in the research areas. Citrine works on a personal project on her spare time, known as the R.R.R. 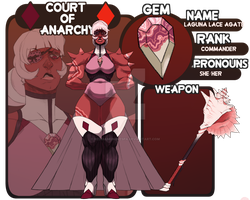 or triple R. She has grown an interest in what powers Gem Destabilizers, wanting to study them closer to uncover more behind Gem Regeneration. She studies Gem Fusions as well, believing that the ability behind fusing might hold a key to regeneration. So far studies have uncovered that stable fusions are more successful because they resonate somehow; destabilizers break that resonance, resulting in gems defusing, and in some cases, retreating back to their gems. If they can be taken apart, can gems be placed back together once destroyed? This is what Citrine has been trying to uncover. She has a fascination with alien technology, even risking herself or others to acquire new tech; More so if she sees it could have use in her studies and further her research on Gem Resonance. Like all gems, Citrine has the ability to summon a weapon through her gem. Her weapon is a sharp-edged gem boomerang. The boomerang is yellow with red coloration on the inside. It has decorative yellow accents inside, and a replica of her own gem in the middle. The boomerang is able to cut through numerous things, like stone and some forms of metal. Miraculously it does not cut Citrine himself, either because of her thick skin or because she is its wielder. Citrine very rarely summons her weapon, relying more heavily on technology to defend herself. She would only summon her weapon if it was a dire situation and all other options were null. 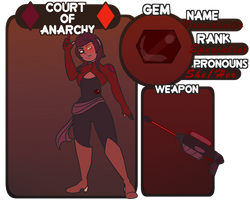 Standard Gem-abilities, including weapon-summoning, bubbling, shape-shifting, fusion, regeneration, agelessness and superhuman durability. Citrine is shown to have a high intellect, manipulating technology with ease. Her hand to hand combat abilities, however, are questionable. Citrine is not very strong, but can sure take a hit. She seems to have tougher skin than your average gem. When activating her gemstone Citrine can summon a sharp gem boomerang. She can also shine in the dark if you ever need a light. Citrine has the ability to shine, and it is most visible in dark places. The ability shines brightest from her right arm, seeming as if her gem is the origin of the glow. She has yet to master the use of this ability since it has gone off during unwanted situations. The light is somehow linked to her state of being, and/or emotions. There have been moments when she has called upon it, but because of her negative state, she is unable to do so. Can i just say that I finally found time to read the whole description and I absolutely love her!! again, super cute gem!! love her story and personality! Aww, she'd appreciate the special treatment. I've never watched Steven Universe, but this is so very cute! Citrine is currently on cloud nine. Wine is a proud mother, she's so proud of Citrine. Wine doesn't even care that Citrine isn't very strong physically, she still holds so much pride for Citrine's intelligence and skill in technology. I MEAN, WHO WOULDN'T BE PROUD, AMIRIGHT?? "What is this? Is this what they call praise?"